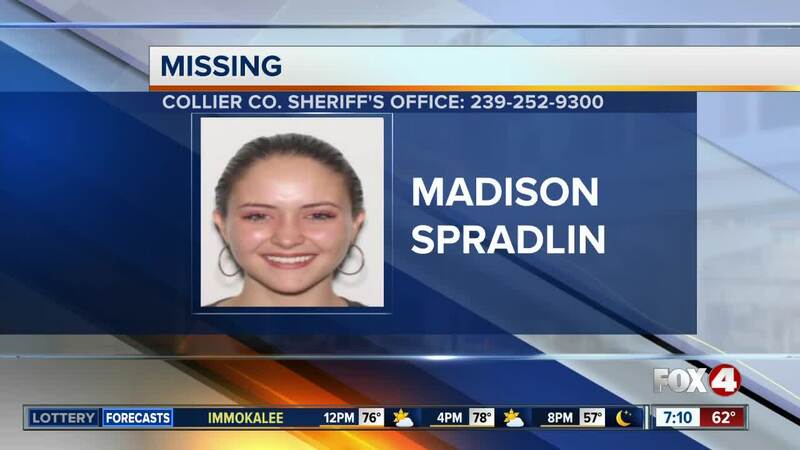 According to the Collier County Sheriff's Office, 18-year-old Madison Nichole Spradlin was last seen on January 2nd and has not been in contact with her family since. **UPDATE (1/10)** -- The Collier County Sheriff's Office has announced that Madison Spradlin has been found and is safe. COLLIER COUNTY, Fla. -- Deputies are asking for help locating an 18-year-old woman who has not been heard from in six days. She is described as a white female, 5 feet 3 inches tall, and 130 pounds with brown hair and brown eyes. Anyone with information on her whereabouts is asked to contact the Collier County Sheriff's Office at (239) 252-9300.